Rarely do I want to rate something higher than Zo's suggestion but I really wanted to give this meal a TF. I enjoyed it very much and it also looked amazing. Zo thought I should give it a GR. I debated a bit and decided I was going to give it a VGR because I really did love this meal! I got the idea in bits and pieces. After having made my first apricot ginger sauce I knew I wanted to use it on some seared salmon, then I started thinking why not make it with coconut and dip it in the sauce, then I thought why not make something fancy looking and tasting! So I did and we both really enjoyed it, I just enjoyed it more! (Just a note about the apricots, they are more for visual appeal and garnish than flavor.) Enjoy! Heat preserves in a small non stick skillet over medium low heat until they begin to liquefy. Whisk in remaining ingredients, remove from heat and chill until ready to serve. Lay apricot slices out in pairs of two and dust them with crack pepper. 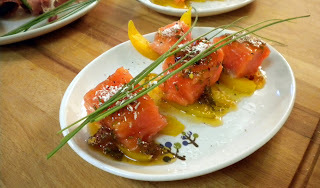 Lay a chilled cube onto each pair of apricot slices and dust salmon with crack pepper. Drizzle 1-1 1/2 tsp apricots sauce over each cube, place over cubes and evenly sprinkle each cube with coconut. Serve right away.